It is a scene etched in film history. 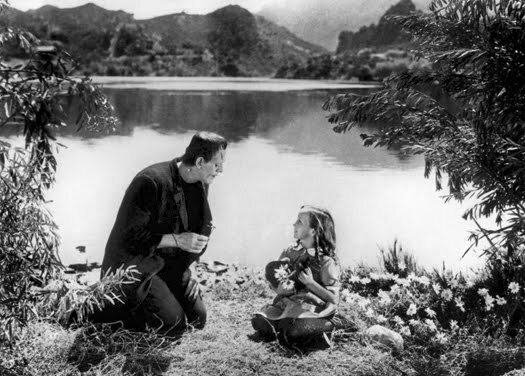 Shot at a mountain lake location on September 28 and 29 in 1931, the drowning of the little girl in Frankenstein was a truly transgressive moment in a film already overloaded with gruesome happenings. 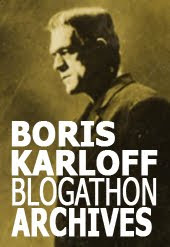 Actor Boris Karloff protested, as did audiences and critics when the film previewed. The scene was jettisoned, cutting off suddenly as The Monster reaches for the child. Unseen for fifty years, the film clip miraculously survived and was eventually restored to continuity. Because of its impact and its enduring notoriety, and the only sequence with The Monster to be shot away from the confines of the soundstage at Universal studios, fans and film historians have long speculated about where the Maria scene was actually shot. In January this year, screenwriter John Cox, armed with recent information and photo references, went looking for the spot where film history was made. 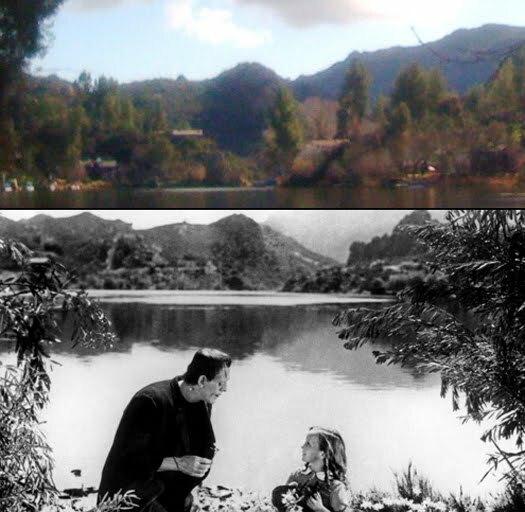 Where did Universal shoot the famous Maria meets the Monster scene in the classic 1931 Frankenstein? For years I could never get a straight answer. Some claimed it was shot on the Universal backlot along with the rest of the movie. But it’s clear from the size of the lake and the rugged mountains in the distance that this can’t be true. My go-to source for all things Frankenstein — MagicImage’s Universal Filmscripts Series Vol. 1 — says only that it was shot at “a mountainous lake.” Rudy Behlmer’s superb commentary on the special edition DVD says it was “almost certainly Lake Sherwood in the Santa Monica Mountains.” Jack P. Pierce bizarrely claimed that it was shot at Malibu Beach. Unable to get a definitive answer, I came up with my own theory. Why would Universal travel so far from the lot when they had Toluca Lake in their front yard? I decided the scene must have been shot somewhere on Toluca Lake and the mountains in the distance were Glendale/Burbank. But then one Sunday morning, while browsing the Internet, I stumbled on the Frankensteinia blog and the article The Lake of Frankenstein. Here at last was an authoritative answer (sourced to an article by Gregory Mank in Midnight Marquee, No. 60). The scene was shot at Malibou Lake on September 28, 1931. (Yes, Malibou, not Malibu.) There was even a map. That’s when I looked up from my computer screen and saw it was 11:00 am on this beautiful Sunday and Malibou Lake was an easy 30-40 minute drive from my house. Should I go? Follow-up comments on the article noted that the exact spot where the scene was shot (which it did not pinpoint) was now “a private home”; so I wouldn’t be able to stand in the footsteps of the monster. But maybe I could still get close. Armed with the map, my camera, and a photo of the scene that gave a good look at the topography, I set out to find the place where Little Maria met her fate. As I drove, I wondered how the crew from Universal traveled to the lake that September day. Certainly in 1931 they were not blasting along the 134 Freeway at 70mph as I now was. It’s possible they traveled along Mulholland Hwy., which begins at Universal City and ends near the Los Angeles/Ventura county line. Or maybe they took Pacific Coast Highway and approached the lake from the opposite side of the canyon. Whatever route they took, in 1931 it would not have been a quick journey. 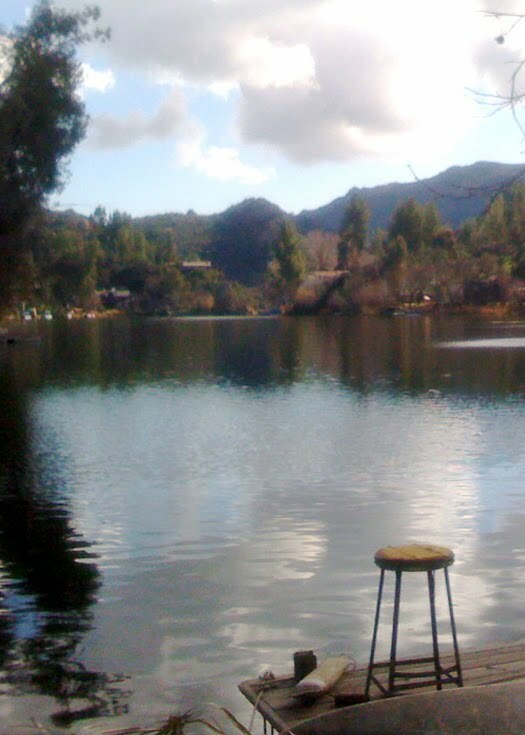 Even today the lake is isolated deep in the coastal mountains of Las Virgenes. As I pulled into Malibou Lake, I was surprised to find such an idyllic setting, a true mountain hideaway resort. Expensive homes and boat slips rimmed a central lake with a small island sitting in the center. Pretty, yes, but nothing looked familiar. This was hardly the rugged “Bavarian” mountain lake of the film. Just over a bridge sat a clubhouse and realtor — the only public buildings — so I pulled off and parked at the clubhouse. Maybe inside I could get some guidance. The door was open, but the clubhouse was empty. On the walls hung photos from famous movies that had been shot on the lake, but Frankenstein was not among them. Not a good sign. I then walked to the realtor, but they were closed on this Sunday. Looked like I would have to find the spot on my own. Dismissing this populated area, I climbed back into my car and drove west along the edge of the lake. Here it became more mountainous and isolated. Several times I pulled over to compare some mountain peaks with my printout of the scene. There was one very clear landmark — a rock outcrop with a bare peak, not unlike the mountain in the Paramount logo. Certainly that would not have changed, and if I could find it, I could use the angle to zero in on the location. As the road wrapped around to the other side of the lake, I found an area that looked very promising. Here there were several rock outcrops that could be the “Paramount peak” in my picture, just from a different angle. The rocks towered over what appeared to be a dry lake bed -- perhaps this could have been the original lake before being diverted to the town entrance, which all seemed quite new. But I could find nothing conclusive. I took some photos, then continued around the lake. Here I started to ascend into the mountains. I certainly wasn’t going to find a lakeside setting up here; so I turned around. At least now I had a range to search. I traveled back down the main road, again stopping to examine some peaks. After taking a few more photos, I decided I had pretty much covered the area and I wasn’t going to find the exact spot. But I had found some possibilities and photographed them and that would have to suffice. And it wasn’t like I’d be able to stand on the exact spot anyway. I drove back into town and again parked at the empty clubhouse. I figured I’d get one last photo of the main lake, which was certainly the most scenic part of the area. This time I walked out onto the town bridge, where I could get the best shot. I raised the camera to my eye and froze. It was the Paramount peak, clear as a bell, sitting directly across the lake at almost the exact angle as the scene photo in my hands. Trees had grown up around it, and there was a house now sitting at its base, but there was no mistaking it. This WAS the lake all along! I was so excited, I stopped a couple who were coming across the bridge at that moment and asked them whether I was crazy or whether that rock outcrop in the photo was the same as the one across the lake. They agreed and, even though they were locals, had no idea of the Frankenstein connection. But what was still throwing me was the island in the center of the lake. That was what had obscured my view of the rock peak when I first arrived in town. It was nowhere to be seen in my photo or the film. The scene must have been shot at an angle that somehow omitted the island. But with the rock peak in my sights, I now had a way to find the spot. Looking around, I saw there was a private gated road of homes that ran alone the lake. Recalling the information that the spot was now on private property, I figured it must have been shot somewhere along that stretch of road. Sure, I would need to trespass, but I would do so conspicuously, holding my camera and printout so I appeared to be exactly what I was — a nosy harmless tourist. I entered via a pedestrian entry and walked along the road with one eye on the photo and one on my Paramount peak, waiting for the magic alignment. But it didn’t happen. If anything, it was now looking less promising than the angle from the bridge. It hadn’t been shot over here after all. I stopped and turned and saw an older gentleman sitting on his sundeck looking out over the road and lake. I went up to him, apologized for the intrusion, and I explained I was a fan of Frankenstein. Before I could finish, he nodded and said “And you’re looking for where they shot the movie?” Yes! He stood and pointed back across the lake, back toward the boat slips across from the clubhouse. “They shot it right there,” he said as he pointed out a grassy spot between two slips. Ironically, it was just yards from where I first stopped when I arrived at the lake. I explained how the island had confused me. He said the island was a relatively new addition to this man-made lake. The area he was pointing to was also private, but he said it was no problem if I went over and had a look. I thanked him and set off. Crossing back over the bridge, I hopped over a picket fence that cordoned off the area and approached the boat slips. As I neared, I instantly recognized an unruly collection of reeds, exactly like those that frame the famous scene. Amazing that they were still here! I then passed a boat slip made of stone with spiked iron gates. Is it too poetic to think this slip was built in a “Frankenstein style” to commemorate the location? I stepped to the right of the slip and walked down a grassy incline to the lake, exactly as Maria and the Monster had, hand in hand, 78 years ago. I raised my photo printout to the horizon and everything lined up perfectly. While tree growth has changed the look of the shoreline quite a bit, the silhouette of the mountains was unmistakable. I was standing on the spot where Boris Karloff and Marilyn Harris, with director James Whales and a full Universal crew, filmed one of the most famous scenes in horror movie history. Thank you for sharing your wonderful adventure, John. I felt as if I was right there with you! Someday, someone must visit again and perhaps float some daisies on the lake, in honor of James Whale, Boris Karloff, and Marilyn Harris. JOHN COX is a professional screenwriter who lives in Studio City, CA. Besides Universal horror, he is also a fan and expert on the legendary magician Harry Houdini and runs the website Wild About Houdini. Such a wonderful story. It made me wish I was there to see the spot too. Sadly I live across the United States in North Carolina. But, If I ever venture out that far I will definately have to check it out. wonderful little hidden treasure story..I love then and now location fotos..I wonder if without any help,I would know where I was if I wandered into that area?? Terrific! Thank you so much, John. And Pierre. I assume Pierce did Boris' makeup at the studio and went along to touch up on the spot. Try to picture that long, rough drive, with Karloff in full makeup, sitting at a backseat window, puffing on a cigarette. I wonder if any passing traffic got a preview--and shocking--look at that iconic face? I was thinking the exact same thing, Rick! 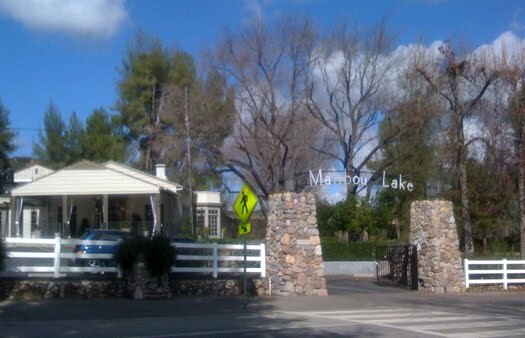 Greg Mank writes that little Marilyn Harris rode with Karloff out to the lake. It would have made sense to do the extensive makeup at the studio, perhaps while the crew was dressing the set and setting up lights and camera at the lake. Cinematographer Arthur Edeson had a home, built in 1926, on Lakeshore Road near the shooting spot. It’s likely that he was the one to suggest the location. I wouldn’t be surprised if his house served as home base for the company during the two-day shoot. What an adventure! Good sleuthing, John, and great article! That's fantastic! Thank you so much for sharing. The secret to finding it is that when you approach the lake, if you cross the bridge to the clubhouse side, you have gone too far. 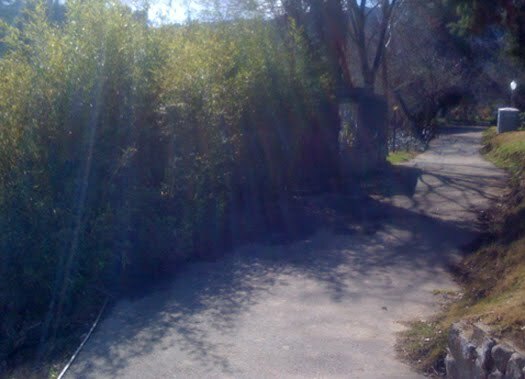 The location is just before the bridge, over the fence, on a small outcropping of land. Yes there are small boat slips very close by, but I've been to the location and can say with certainty I've narrowed it down to within 10 feet of the actual location. If you go early enough in the spring, before the summer heat makes them wither, they have daisies planted along the road near the club house. I've floated them at the spot on a few occasions now. Don't expect them to be there on the anniversary of the shoot next month (September) though as it is too late in the season. I actually live in malibou lake. and yes, its sort of a town legend that frankenstine was filmed there. Also, that mountain that you said looked like the paramount logo actually was the paramount logo, although they changed it. The mountain was called paramount mountain until it was renamed sugerloaf mountain. Thought you'd like to know. 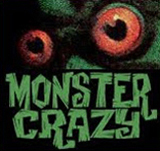 Re: "The scene was jettisoned, cutting off suddenly as The Monster reaches for the child." Cutting the scene at that point just made it worse. Instead of seeing that the monster expected Maria to float, like the daisies, we jump from him reaching for her to the sight of her father carrying her dead body. I wonder that no one mentioned the implications at the time. That may well be close to the spot. However despite claiming that the images correspond exactly, the photos do not match. I see a resemblance between the 1931 shot and your newer photo, but not an exact image. You were not on the exact spot. I am fortunate to live at Malibou Lake. Indeed, the scene was shot here as described in John's posting. A lot of other famous scenes were shot at this lake back in the day, as well: scenes from Gone With The Wind, The Thundering Herd, Butch Cassidy & The Sundance Kid, etc. And, of course, the Mash set is just on the other side of the dam, here. As far as Frankenstein info, you might check out Brian Rooney's "Three Magical Miles". He is a local historian who has done some extensive research on this lake and the surrounding areas. He has some amazing Frankenstein production photos from the lake that you probably have not seen. Remember, though, that its a private lake and outsiders are often chased away. Huge Frankenstein fan. I stumbled on your blog through Facebook and was delighted to read this article. Thanks for posting it. It may have been written almost 7 years ago but it's still a joy read.